The SAP® Business One application offers a single, affordable way to manage your entire business – from sales and customer relationships to financial's and operations. Designed specifically for small businesses, it helps you streamline processes, act on timely information, and accelerate profitable growth. Create quotes, enter orders, and provide better customer service. Track sales opportunities and activities from first contact to the close of sale. Initiate marketing campaigns by using templates for mass e-mails. Provide support for customer service, service contracts, and warranties. SAP® Business One helps you manage your general ledger, journals, budgets, and accounts payable and receivable. You can conduct all your banking activities – including processing payments by check, cash, credit card, bank transfer, and bill of exchange – as well as reconcile various accounts and create financial reports for profit and loss, cash flow, balance sheet, and aging. You can also update account postings at the exact time relevant business events occur. Every small business needs a systematic approach to managing the procurement process, from creating purchase orders to paying vendors. SAP® Business One helps manage the complete order to- pay cycle, including receipts, invoices, and returns. You can also plan material requirements for production, control bills of materials, and replenish inventory automatically. And using integration with Crystal Reports, you can analyze your vendors’ performance and adjust your procurement strategy accordingly. SAP® Business One also lets you readily manage your inventory and operations, including picking, packing, delivery, and billing. You can perform inventory valuation using different methods such as standard costing, moving average, and FIFO; monitor stock levels; and track transfers in real time and across multiple warehouses. In addition, you can run real-time inventory updates, availability checks, and manage pricing and special pricing, which allows you to automatically apply volume, cash, and account discounts to transactions with vendors and customers. SAP® Business One provides powerful, integrated analytic and reporting tools to help you access the critical business information you need. With SAP® Business One, together with fully integrated Crystal Reports, you can gather data from multiple sources and generate timely and accurate reports based on critical company data across financial's, sales, customers, inventory, service, production, and operations. Completely integrated with the Microsoft Office products and focused on data security, Crystal Reports allows you to choose from a variety of report formats and to control access to information displayed. You can also use additional functionalities that are an integral part of SAP® Business One such as “drag and relate” and interactive drilling down through multiple levels of relevant data to get complete information instantly. SAP® offers a remote support platform for SAP® Business One to help you maintain your software system more easily and proactively prevent potential issues from impacting your business activities. As an automated monitoring tool, this remote support platform helps identify system bottlenecks by enabling SAP® support services to collect information on your system status and check the system against known support issues. By sending regular status e-mails and automatic fixes, it allows you to avoid issues from happening and decrease the time you would otherwise spend on IT support. In addition, the tool provides several other services including automated database backups, pre upgrade evaluations, inventory valuation checkups, and system installation health checks. By integrating all critical business functions, business information captured in a single system is instantly accessible across the organization, eliminating duplicate data entry along with related errors and subsequent costs. What Makes SAP® Business One right for You? For the first time, business owners have a single system built specifically for SMBs that can help you gain greater control and achieve increased profitability. 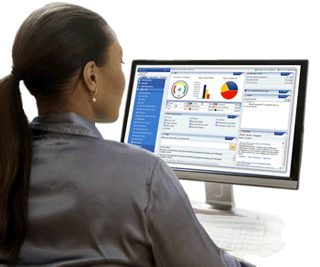 Delivers quick access to highly accurate, business-technical information. 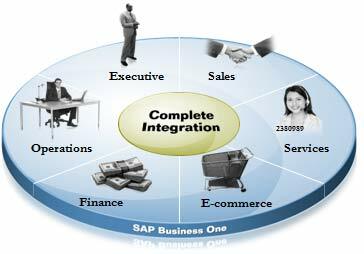 Is supported by the world leader of business software solutions, SAP®. SAP® is the worlds leading provider of business software solutions. More than 60% of SAP® implementations are in small and midsize business's. With 12 million users and nearly 80,000 installations, SAP® solutions mean far more than hardware and software. SAP® Business One is delivered by a worldwide network of qualified business partners that leverage SAP® global knowledge to provide local service and support. B1Works.com is a division of Virtual Graffiti Inc, an authorized SAP Business One Partner.